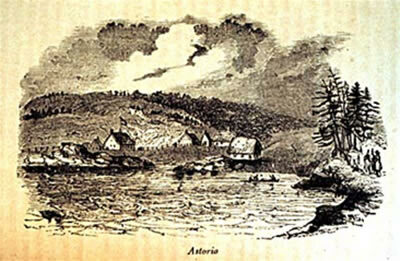 Engraving of Astoria, the fur trading post established by the Astor Party. Follow this link for further graphics concerning the Astor Party. United States gained independence from Great Britain, 1776-83. 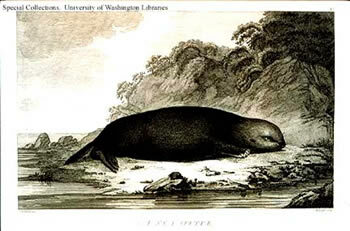 Robert Gray traded furs on the Northwest Coast and discovered the Columbia River, 1788 and 1792. 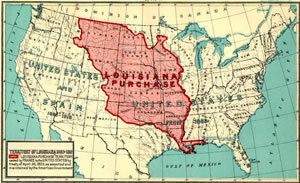 Louisiana Purchase, 1803, acquired for the U.S. the lands between the Mississippi River and the Rocky Mountains, north of Spanish holdings in the Southwest. Lewis and Clark Expedition explored overland from St. Louis across the Rockies to the mouth of the Columbia River, 1804-1806, staking U.S. claims to territory along the way. John Jacob Astor’s Pacific Fur Company established posts at Astoria and elsewhere along the Columbia River, and initiated the American land-based fur trade in the area, 1811-1813. By the end of 1813, however, the enterprise sold out to the North West Company and was also captured by a British naval vessel as a prize in the War of 1812. The Convention of 1818 resolved territorial disputes issuing from the War of 1812, and authorized a “joint occupancy” of the region whereby the rights of both British subjects and American citizens to “occupy” and do business in the region were recognized. The United States was, compared to Russia, Spain, and Britain, a latecomer to the Pacific Northwest. When Spain and England were sending the first exploring expeditions to the Northwest Coast, the United States was breaking away from Britain and winning its independence. The new republic was certainly more like Britain than Spain, in terms of its political and economic orientations. But it had substantially fewer resources, than did Great Britain, that it could devote to colonization. For example, it did not have the well-capitalized trading companies that Britain had, and it did not have a powerful navy or a maritime tradition of exploration. Consequently, its approach to the Northwest Coast was initially somewhat hesitant and limited. But when Spain and particularly Britain became preoccupied with the French Revolution and the rise of Napoleon in Europe between 1789 and 1815, the United States seized the opening and became more active in the region. It especially pursued the sea otter trade there. Whereas Britain sent twelve trading vessels to the Northwest Coast between 1795 and 1814, the U.S. sent ninety vessels over the same period. After 1814, however, the British reasserted themselves in the region—primarily through the land-based fur trade—and until the 1840s ranked as the prevailing colonial power there. American activities in the Pacific Northwest between 1788 and 1814, then, represented mostly a temporary phase of colonization. During this phase, the U.S. established claims to the territory, through exploration, trading fur, and occupation of land, and these claims would eventually give the U.S. a stake in the Pacific Northwest that it otherwise would not have had. But these claims did not represent systematic and long-term colonization—in large part because the United States was not yet in a position to undertake such expansion. Rather, U.S. activities in the Pacific Northwest prior to 1814 emerged from two sources within the United States, neither of which was forceful enough to implant long-term American control over the region. One was commerce, and the other was nationalistic exploration. American ships took the lead in the maritime fur trade off the Northwest Coast in the 1790s. Based and financed out of Boston, for the most part, these vessels brought trade goods to exchange with Indians for sea otter pelts. From the Northwest Coast the ships went to China, where they exchanged the pelts for such goods as tea, silks, and spices. From China the ships returned to Boston, where they sold the Chinese imports at profits that made the entire voyage worthwhile. In these expeditions, American traders were taking advantage of an area of the world where resources seemed accessible. Upon leaving the British empire, the United States was excluded from trading in places where American colonists had traded before. The fur trade of the Northwest Coast represented an opportunity where Americans did not need to contest other entrenched powers. However, these traders were often narrow-minded in their approach to the Pacific Northwest. Claiming territory on behalf of the United States, for instance, was not uppermost in their minds. Consider for example the diary of John Boit, a member of Robert Gray’s crew. Gray “discovered” the Columbia River in 1792 when he entered its mouth looking for Indians with whom he might trade for furs. But Gray was a businessman, not an explorer. And Boit’s diary reflected that fact. It noted that Gray landed in order to “view the country.” Only later, and in a different hand, were the words “and take possession” added. The idea of claiming Northwest lands for the U.S. was but an afterthought to most traders. A few other Americans, however, had more nationalistic ambitions in mind. One of them was Thomas Jefferson, whose concern about exploration resulted in the U.S. staking a strong claim to the region. Jefferson’s interest in the lands to the West of the United States (the nation’s western border between 1783 and 1803 was the Mississippi River) stemmed in part from his own curiosity in the geography of North America. He had a strong interest in what resources the continent might offer to Americans and others, and he also worried that the young nation needed an ample supply of land to accommodate the agrarian aspirations of himself and others. Moreover, Jefferson worried about the British, Spanish, and French on America’s borders, seeing the presence of these Europeans as destabilizing or threatening to American interests. Long before he became President in 1801, Jefferson worked to get Americans to explore westward and contest the expansionist efforts of its rivals. In 1783, at the close of the Revolution, he asked war hero George Rogers Clark to lead an expedition across the lands between the Mississippi River and the Pacific Ocean. In 1785, while serving as U.S. representative in France, Jefferson schemed to assist another American, John Ledyard (an American who had sailed with Cook to the Northwest Coast in 1778), who wished to establish an American fur-trading enterprise on the Northwest Coast. In 1793, while serving as the nation’s first Secretary of State, Jefferson hatched a plan to hire the French naturalist Andre Michaux to explore the Rocky Mountains and beyond. None of these attempts met with any success, but they demonstrated Jefferson’s abiding interest in staking a stronger American claim to the territory of the Pacific Northwest. Map of the Louisiana Purchase (left). Jefferson’s plans reached fruition during the first dozen years of the 19th century, in part because as President from 1801 to 1809 he finally possessed enough power to enact some of his ideas about nationalistic exploration. In 1803 Jefferson secured the Louisiana Purchase, by which the U.S. acquired from France most of the territory between the Mississippi River and the Rocky Mountains (when Jefferson had proposed exploring this land earlier, he had essentially been asking expeditions to cross territory claimed by other European nations). Also, between 1803 and 1806, Jefferson dispatched the Lewis and Clark Expedition, which traveled from Saint Louis to the mouth of the Columbia and back. Traveling by land across the northern plains, Rockies, and Columbia basin, Lewis and Clark staked an ever stronger American claim to the Pacific Northwest. American fur traders followed Lewis and Clark into and across the Rockies, the most famous of whom were representatives of the Pacific Fur Company of John Jacob Astor, who established a post at Astoria in 1811 and additional posts along the Columbia thereafter. Although U.S. initiatives produced significant results, they did not generate a lasting American presence in the Pacific Northwest. Rather, while the Astorians and the Lewis and Clark expedition staked important claims to the territory for the U.S., they were at best an ephemeral presence in the region. Lewis and Clark came, catalogued the resources of the country, and left. The Astorians set up posts along the Columbia and conducted both trade and exploration, but they were bought out by a British rival, the North West Company, and their post at Astoria was also seized by the British navy during the War of 1812. By 1815, in effect, the British had reasserted dominance among colonizing powers in the region, and the Americans were forced mostly to withdraw and bide their time. British military and financial might help explain this outcome. Its navy was stronger, and its experience and capital in the fur trade were greater. All the U.S. could fall back upon were its claims of prior discovery—established by Gray, Lewis and Clark, and the Astorians—and the rights allotted it by the Convention of 1818, written to resolve territorial disputes following the War of 1812, which permitted the U.S. to occupy the Pacific Northwest jointly with Britain for an indefinite period.